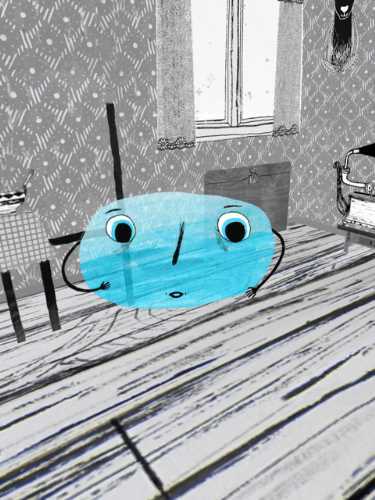 A masterpiece of children's media that blends wintery Nordic storytelling with beautifully-executed virtual reality to teach kids about kindness. 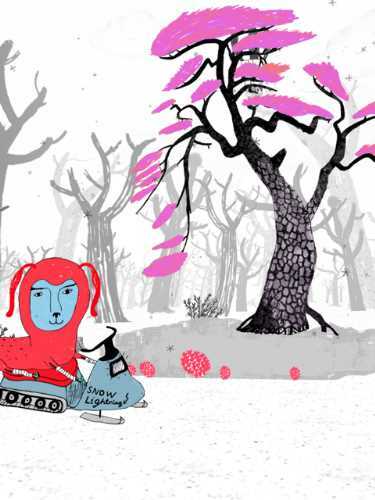 Wuwu & Co. - A magical picture book presents stories in a fresh manner by combining printed words with virtual reality. 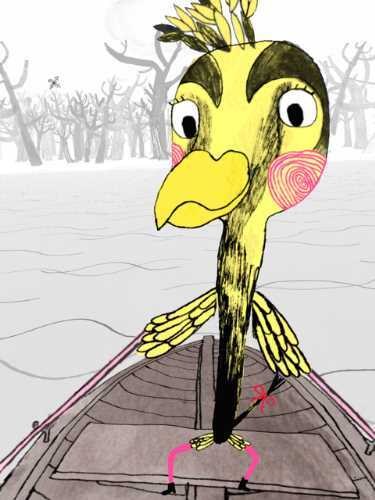 The app starts out as a book about a cute, yellow-beaked character and her four friends who live in a magical forest. The forest is experiencing an unusually cold winter, and the five friends seek out the reader's help. Players meet the characters inside a red house nestled in the forest. When the device is held flat, the reader experiences a book with printed pages. But when the player picks up the device, the view on the screen changes to become a 360-degree interactive experience. Using virtual reality, the app superimposes an interactive world on the screen, which you discover by turning around in a complete circle. At first, you explore the inside of the red house, where the characters have come to seek your assistance. After finding the key and then unlocking the front door, you watch the five colorful characters enter the house. Tapping on a character launches his or her story. Players are asked to lay down the device so that the written story appears as it is read aloud (there is an option to turn off the narration for children who want to read it alone). Each character's story ends with a request for help. 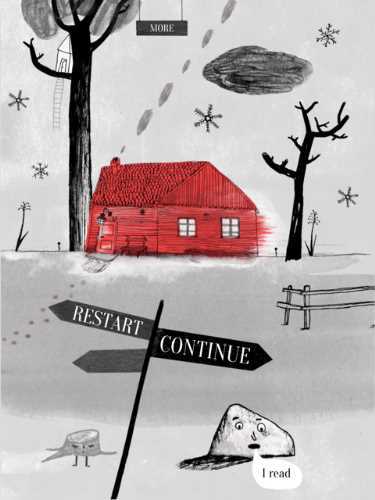 To help the character, the player picks up the device and is magically transported outside of the red house into 360-degrees of forest to find or do something to help the character. Wuwu & Co. earns our perfect 5-star rating for a kids' app because it melds exciting storytelling with a rich technology experience. The use of the virtual reality adds to the storytelling, making the play experience magical. Kids feel as if they too are transported into the forest in the winter. Each of the stories is clever and interesting, but the best part is that each relies on the player's kindness to finish the tale. The reader must do something to help the character, so that the story can have a happy ending. 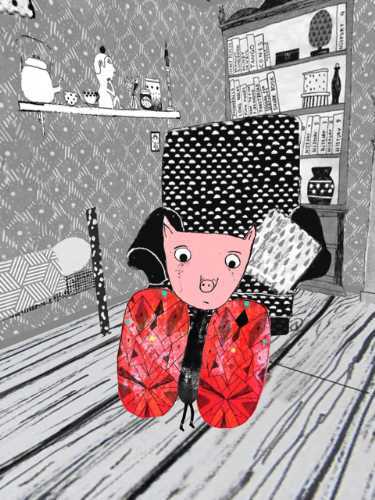 In one about Everett, a pig-faced butterfly, players save Everett's siblings from freezing to death by shouting at them to wake up and come out of their cocoons. With Wuwu, a bird-like character, players help her by chasing away a shark that is poaching on her fishing area. In helping Storm, an oval see-through character, players need to hunt in their own world to find something yellow so that they can fill Storm's jars of firefly light. By modeling kindness, kids learn how and why it is important to help others. 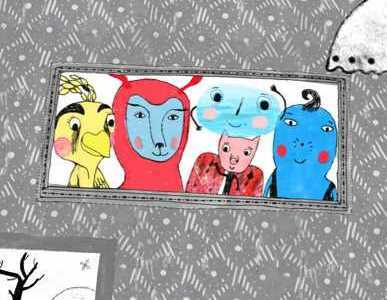 Wuwu & Co. tickles kids' senses by painting its protagonists in an avant-garde art style, using bright colors. They stand out because their colors create a sharp contrast to the muted background scenes. Kids will meet both realistic and fantasy characters. I was delighted to meet Pruney, a troll who is deaf. His deafness becomes a part of his story, as kids learn that others are afraid of the troll because he inadvertently makes scary sounds, which he doesn't hear. The app features an atmospheric soundtrack and exciting narration by Alistair Findlay (the talented actor who reads the Nighty Night apps from Fox & Sheep), which adds to the already remarkable presentation. In addition to the English narration, this book app can also be read in Spanish, French, and German. Wuwu & Co. is a spectacular children's app that shouldn't be missed. In the crowded market of children's apps, it stands out for its unique art style, its exciting use of virtual reality, and its storytelling that focuses on involving kids in acts of kindness. This review of Wuwu & Co. - A magical picture book was written by Jinny Gudmundsen.